MANILA, Philippines – The results of April 2018 NAPOLCOM exam are officially released online in three (3) months after the exam or on July 12, 2018. 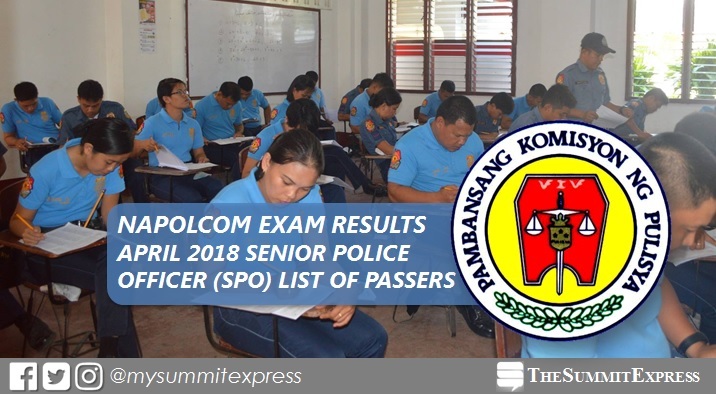 A total of 3,037 of the 7,343 (41.36%) examinees hurdled the SPO Exam. View on this page for the complete list of passers for Senior Police Officer (PO) examination. 18-04-0801553, ORQUIA, BRYAN REY LOBRIO. NAPOLCOM also conducted PNP entrance exam to a total of 31,385 aspiring policemen. NAPOLCOM said that the list of successful examinees shall be available at their central office located at the DILG-NAPOLCOM Center, NAPOLCOM Bldg., Edsa Corner Quezon Avenue, West Triangle, Quezon City, and can be viewed at the NAPOLCOM website at www.napolcom.gov.ph.